Alexandria, did I miss it? Alexandria! 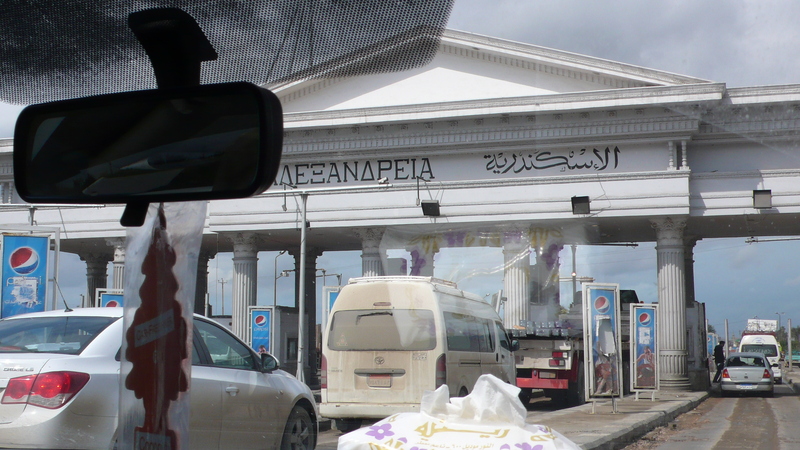 Imagine my excitement coming upon the entry gate to the city, with the name spelled out in Greek, in honor of its founder Alexander the Great. But just past the gate the trouble started. 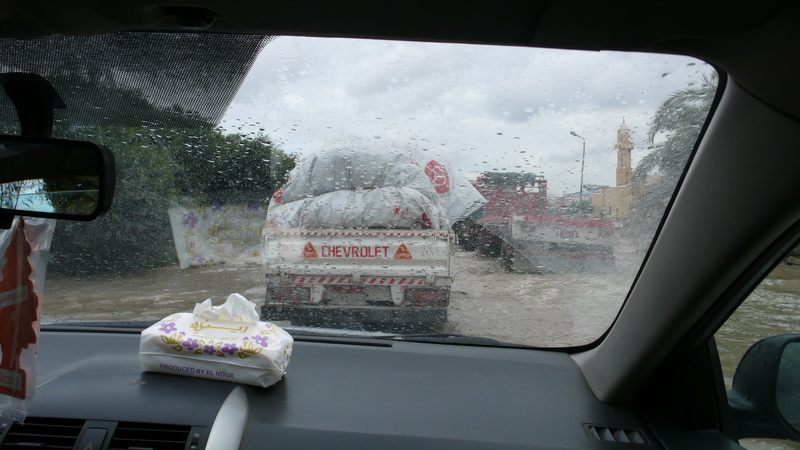 There has been some rain here, and it took out a part of the highway. Water up to the chassis! This was starting to look pretty different from Alexandria as I had pictured it. A city’s outskirts tend to be its ugliest parts, but the center is usually the old city, with some monuments left. Embarrassingly enough, how I pictured old Alexandria was informed by this painting, started by Gentile Bellini and finished by his brother Giovanni. It shows St Mark preaching in Alexandria. The painting shows some of the famous monuments of Alexandria. To the extreme left you can see the tip of the Pharos, or lighthouse, one of the 7 ancient wonders of the world. It was destroyed centuries ago. To the right is the top of a column, known (erroneously) as Pompey’s Pillar, because it was believed to hold the remains of the Roman general who had taken refuge from Julius Caesar in Egypt. In the center is a highly imaginative reconstruction of the Temple of Serapis, destroyed in the 4th century. St Mark is shown converting the pagan residents of Alexandria to the new faith. Do you see the obelisk directly above his head? 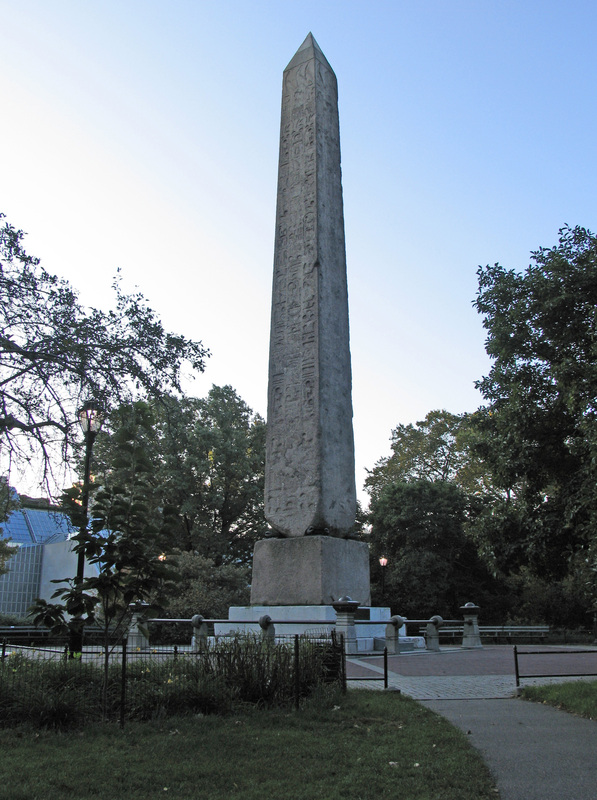 Well, there were two obelisks here near the Temple of Serapis, but in the 19th century, the height of colonialism, they were “given” away, one to London and one to New York. Here is the New York one, installed in Central Park right behind the Met. So I wasn’t expecting obelisks, and I wasn’t expecting a great Temple of Serapis, but I thought maybe I would see some old structures, at least ones going back to the period of Bellini, and I knew that Pompey’s Pillar was still there. I know it seems silly, but it was the one thing in the painting that had some real connection to what is on the ground here, and I wanted that connection. Bellini had never been to Alexandria (though he had visited Istanbul), so his information was highly filtered, but he did know about the pillar, and it is still here. I knew it wasn’t going to be anything special, just a column, but I wanted to see it, touch it, the one material connection between this painting, this place, and me. So I went first to the Museum, saw some nice things, then met a representative of a new local art school, called Mass Alexandria, and asked her whether she wouldn’t mind seeing Pompey’s Pillar before we headed to the school, where I was going to talk to the students. We walked and walked and walked in the very, very busy streets of Alexandria, streets no less busy than those of Cairo. We saw Cavafy’s house, so we paid a visit. We walked some more. I thought I had it pretty well figured out where the Pillar was, but we just couldn’t find it. Absolutely no one in Alexandria speaks a word of English and, foolishly, I had forgotten to memorize the Arabic name for Pompey’s Pillar (which has nothing to do with Pompey). The hour was getting late and the school is miles outside of town, so I proposed we get in a cab, make him take us past the Pillar so I could get out, have a look, and we could proceed. But he had no idea what we were trying to say. So we just ended up going to the school, arriving an hour late because of the terrible traffic. Basically, I was defeated by Alexandria. The school, though, was another story. Mass Alex is an effort to provide an alternative to traditional art schools here, which still operate on the beaux arts model. Here is a good link to it. These students are interested in being part of the world of contemporary art. Bellini was turned eastward, in his day the origin of most of the important things, but these students want to be part of the contemporary scene, which means they are turned west. But they didn’t know much about it. I had to spell the name Sol Lewitt for them. They had never heard terms such as Institution Critique and Post-medium condition. So what I wanted to get across to them was that the modalities of contemporary art–the stuff that fills contemporary galleries and biennials of art–seems like a recent and foreign language, but actually that wasn’t true. Installation art did not “belong” to contemporary art. Neither did the idea of anti-authorship or collective production. And the same goes for Conceptual art, Process art, Performance art. Etc.. There are ways to see these ways of producing art in other contexts, in premodern contexts, for example. The idea, ultimately, was to encourage them to see these things not as a foreign international language that they needed to learn but as modes to be dismantled and repurposed. They seemed pretty excited when I left. They wanted me to advise them on their specific projects, things like how to turn script into video art. (Still not sure what that student meant!) So I missed old Alexandria (or Alex as the residents call it) but I saw something of the new Alex.